How can I expand or migrate a RAID set on a HP RAID Controller? I recently needed to expand a RAID array on my HP ML350 G5 test server from a 5 drives RAID 0 configuration to a 6 drive RAID 5 configuration so that I could have redundancy as well as performance. My server has a HP P400 Smart Array Controller, but this process is pretty much the same on all HP RAID controllers used in the 300 series or higher servers. To expand or migration a RAID set on a HP RAID controller is a two step process. Firstly you must expand the array to include the new drive. The second phase is where you migrate the array to take advantage of the space on the new drive. During this 2nd phase you have the option to also change the Stripe size and or the RAID type based on the number of drives you have installed in the system. This procedure below shows you how to do this process. Ensure you have a complete backup of all data on the RAID array you plan to expand. Ensure that you perform the expansion and migration at a time of low system use, ideally have all users off the system if possible. On the server itself, login as an administrator and then login to the HP Array Configuration Utility. Ensure that the new drive is not part of any array. Select the existing array you wish to expand and then “Expand the array”. Select the new drive that you have added to the system and confirm that you wish to expand the array. The array expansion process will now commence. This will take time – anywhere from an hour to a few hours dependant on the size of the drives and the load on the system. Once the array is expanded, close the HP Array Configuration Utility and reopen it – this is due to the fact that some information only refreshes correctly when you open the Array Configuration Utility. Now navigate to the Array you wish to migrate, select the Array and then “Migrate Array” from the right hand menu. You will select the applicable RAID type you wish to migrate the array to, ie RAID 5 in this instance, and also select the Stripe Size. Do this and select “OK”. You will see a screen similar to the one below – note that is is “Transforming 0%”. The Array will take some time to expand. It is recommended that you do the expansion at a time that is low load on the system to ensure it does not interfere with normal system operations. Performance during this time WILL BE SLOWER than normal due to the RAID expansion. After the RAID expansion is complete, you will see the screen return to normal. Close the Array Configuration Utility and reopen it. Expand the Array and then select the Logical Drive. Select the More Information button and you will see the screen below. This is after around 8 hours. The RAID migration is complete, and the background Parity Initialisation is in progress (it’s at 44% right now). This means that the process is not complete and disk performance will still be adversely affected. Wait a little longer. Your array expansion and migration is now complete. All data should be in tact and things should be working as you expected them to be. I don’t recall how long it took sorry. Given 2TB disks are fairly new, I would have ensured that the firmware and drivers were the most current as there may be some optimisations in those new drivers/firmware that may help performance. Hi Wayne, we have a server like yours. I asked to hp if my e200i support 2tb and they never replied, i want ask you if you know anything about that. In your server the p400 controller is integrated (p400i) or installed as pci-ex card ? I have some difficulties to find the pci-ex (4x -> 8x ) expander to allow the p400 to operate at 8x, have you got it? I’m sorry – I don’t know about support for 2TB drives – I would think that if you check out the most recent firmware for it to see if they mention support for them there or not. I have a question about expanding RAID volume. I have MSA2000 and a MSA 2312i controller. I have 12 drives installed into MSA. 8 of them are of size by 2 Tb, and they are in RAID 1+0 volume of size by 8 Tb. Other 4 drives of size by 1 Tb are in another RAID volume. I need to make one RAID volume of these two without loosing any information. I’ve found an Expand feature in MSA management system. Could I use it for my aim? I’m ready to delete second RAID volume. Thanks before, I’ll appreciate any help. Wayne, thanks for the answer. Array configuration utility looks similar to mine. How it’s going on your MSA system? I too have an HP server using the array configuration untility to manage an array. 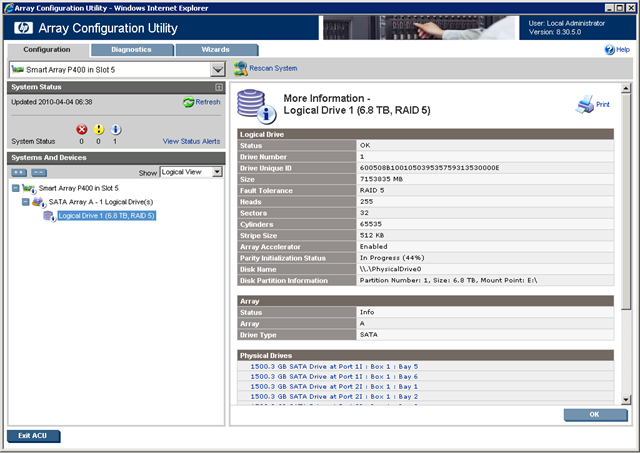 In this case it is an E200 card with on a DL180G5 with (4) 146Gb SAS drives as a single logical drive with SBS2008. I want to move to 300GB SAS drives, which I can install as well and create another logical volume. Symantec System recovery can copy (live) the OS from one drive to another. The reboot and re-direct to the new boto device with the BIOS? Is this the best way to migrate from the 146Gb array to the 300Gb array? I think this should/could be a lot simpler. PS MSA systems connect via a raid card in the serrver to an external enclosure…. so they should operate exactly the same way as an internal cage. Wayne, would it be possible to apply the same steps you mentioned above on expanding and upgrading Raid 1 to Raid 5 if I´ve my Operating system installed on the Raid 1 I´m pretending to expand and upgrade. I´ve an HP DL 380 G6 with array controller P410i. Yes – this will work for a RAID 1 to RAID 5 migration as well. The one thing you need to watch however is to ensure that your boot drive does not go above 2TB as this will cause it to fail to boot. I’ve not done a migraiton exactly like the one you are planning, but this is a consideration I’d be cautious about. I am expanding the RAID5 array on my ProLiant DL385 SmartArray 6i – it looks like it will take 70 hours total from my calculations of the percent complete changing every 40 minutes or so. Question: Will the server be able to function and still continue the expansion without problems? I want to Start the SQL Server services at about 50 hours into the Expansion because people will be looking for it then (all connections through a different Web Server). Will SQL Server work along with the Expansion? Hi. I faced with 2TB limit problem, but this post helped me to solve it – http://sysadm.pp.ua/linux/monitoring-systems/hpacucli-raid-build.html . Maybe it will be usefull.